In South Korea, Kakao Corp. dominates the mobile scene. 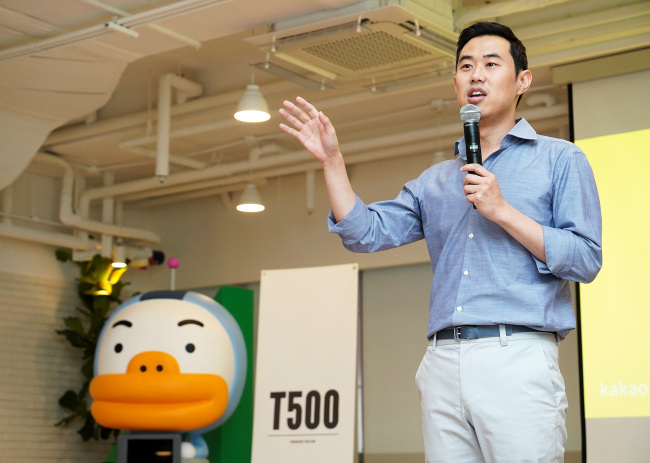 Since overtaking the country’s mobile messaging market with KakaoTalk, the company has leveraged the clout of its messenger app to provide a range of new mobile services ranging from games, web comics to payment, e-commerce and even taxi hailing. Despite its domestic glory, 7-year-old Kakao has continuously faced concerns and doubts over its growth potential as its messenger is confined to Korea with little presence in countries abroad. Though its messenger is unlikely to win over new markets, Kakao has not given up on its vision to go global. After years of searching, the company believes it has a chance for overseas success in a new business — content distribution. “Going global has long been Kakao’s dream and aspiration. And I’ve always believed it should be done with our strongest assets that can successfully appeal to markets abroad,” said Kakao CEO Jimmy Rim during a rare meeting with the local press at Kakao’s headquarters in Pangyo Wednesday. “Since 2016, we’ve been preparing to tap global markets with what Korea excels in — content. Not K-pop idol groups, but Korea-made games, character emoticons, web comics, web novels and more,” said the 36-year-old CEO. According to Rim, Kakao hopes to build in overseas markets a strong distribution platform for webtoons and mobile games, as it did in Korea. And in doing so, the company believes it can assist globally-competitive content from Korea in reaching out to foreign audiences. Its early efforts are now beginning to take fruit. Kakao Japan has recently been seeing explosive growth in its mobile manga comics platform app Piccoma. It breaks down manga of versatile genres into chapters offered at cheaper prices, appealing to a broader user base. To Piccoma, Kakao has also applied a new monetization model, the so-called “free if you wait” scheme. Basically, users can access a chapter for free if they wait 24 hours. And those who cannot brave the wait can make a purchase instead. In the span of one year, the mobile manga app has seen the number of visitors per month jump from just 50,000 to 2.5 million last month. The app’s average transaction volume per day currently exceeds 10 million yen ($89,000), according to Kakao. Though Piccoma’s offerings consist mostly of Japanese manga for now, the platform does feature an array of popular Korean web comics, or webtoons. Despite their small portion in the app, the Korean webtoons have been scoring high views from Japanese readers, signaling potential as a competitive content, Kakao said. On top of Japan, Kakao is also simultaneously tapping China in partnership with Tencent. As of now, Kakao has brought a number of Korean webtoons to Tencent’s web comics as well as its “free if you wait” business model to the web comic website Tencent Dongman. The Korean mobile messaging firm is making similar efforts in North America via US-based Tapas Media, an English-based webtoon platform operator that Kakao has made strategic investments in. Taken together, Kakao said it currently reaps around 1 billion won ($883,000) per month as licensing fees for the Korean comics it exports onto the overseas platforms, with expectations for continued growth. “I believe that Korea possesses strong content, and that the technology Kakao owns can help such content (reach global audiences and make due profits),” Rim said. While content distribution will underpin its overseas business, Kakao’s roadmap for its core Korean market will be driven by artificial intelligence technology and third-party partnerships. 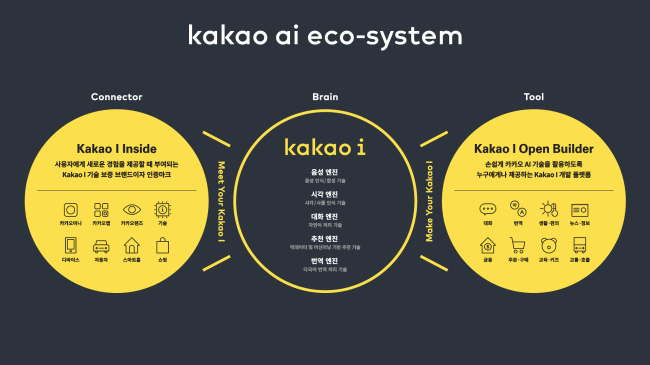 Under a vision to “connect everything,” Kakao plans to launch a beta version of an open development tool for its AI platform Kakao I in October, with plans for a full release early next year. Kakao I will offer five engines for voice, image, chat, suggest and translation that can work inside apps and smart services like chatbots or be integrated into hardware made by third parties. Interested developers will be able to create smart services powered by Kakao’s AI engines. Kakao is expecting some partners to develop services that can be connected to Kakao’s existing services as well as its smart speaker Kakao Mini slated to hit the local market in October. Kakao has already secured a number of collaborative partnerships for Kakao I, including those with Samsung Electronics, Hyundai Motor, Lotte Commmunication, GS Engineering & Construction and POSCO Engineering & Construction.